Hi, I’m Angela. I would be delighted to help you arrange your holiday to Peter Island. Whether you are looking for a full package, flights, transfers, a luxury villa or an island buyout – I have access to all the very best offers available and can provide you with firsthand knowledge of this wonderful resort. I would be more than happy to discuss the individual room types with you and I have visited all the villas so would be happy to recommend the right villa to suit your needs. Leave me your contact details and I will be in touch as soon as possible. Set sail for the Caribbean's most extraordinary co-ordinates; arriving by water to Peter Island's marina is a breathtaking experience. As the largest private island in the British Virgin Islands, this is a true haven of tranquility awaiting those who truly want to get away from it all. This incredible tropical paradise offers flawless beaches and the shallower waters surrounding the island are ideal for bathing, snorkelling and watersports. Other facilities include a magnificent pool overlooking the ocean and surrounding islands, mountain bike trails, tennis, gym, dive centre and a sumptuous 10,000 square feet spa where you can enjoy a wide range of revitalising treatments. Service is paramount on the island and every room has a butler. Ocean view options offer close proximity to the main resort facilities whilst the highly popular Beachfront Junior Suites boast picture-postcard views framed by romantic sunsets and sailboats drifting lazily by. The resort houses 3 luxury villas ranging from three to six bedrooms offering self contained privacy with access to all the facilities of this private island retreat. Exquisite dining includes contemporary European and Caribbean flavours created with local fresh ingredients plus there's the famous Tradewinds Wine Room. You can even exclusively hire the whole island...ask about our island buyout rates. Reserve your place in luxury and give me a call today. 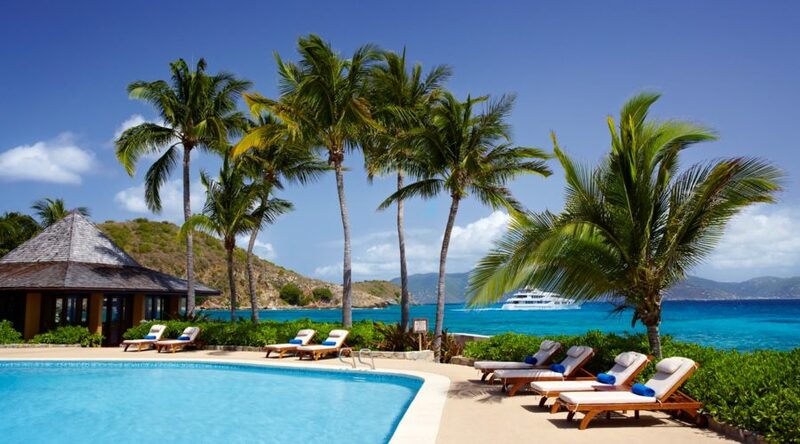 View our gallery of images from the fabulous Peter Island resort, British Virgin Islands. Learn more about this welcoming and tranquil resort and all it has to offer. See the selection of rooms and villas. You can even buyout the full island! Exquisite dining in elegant surroundings. Occasionally, reserving your private place in luxury on an island isn't enough...sometimes, you just need the whole island! Although prices will vary in line with seasonal demands, we are confident that will be able to secure a great deal for you.